The first ten page 391 magazine would feature quotations from Tristan Tzara, Albert Camus, Genesis P-Orridge’s sleevenotes to ClockDVA’s album ‘Thirst’, and a quote from the nineteenth century Tibetan Lama Mipham, lifted from a poster accompanying Section 25’s Always Now album for Factory Records; as well as collages of images and original writing and polemics. Copies would be sold at gigs and via mail order for the princely sum of 20p, with a print run of at least a couple of hundred if memory serves. 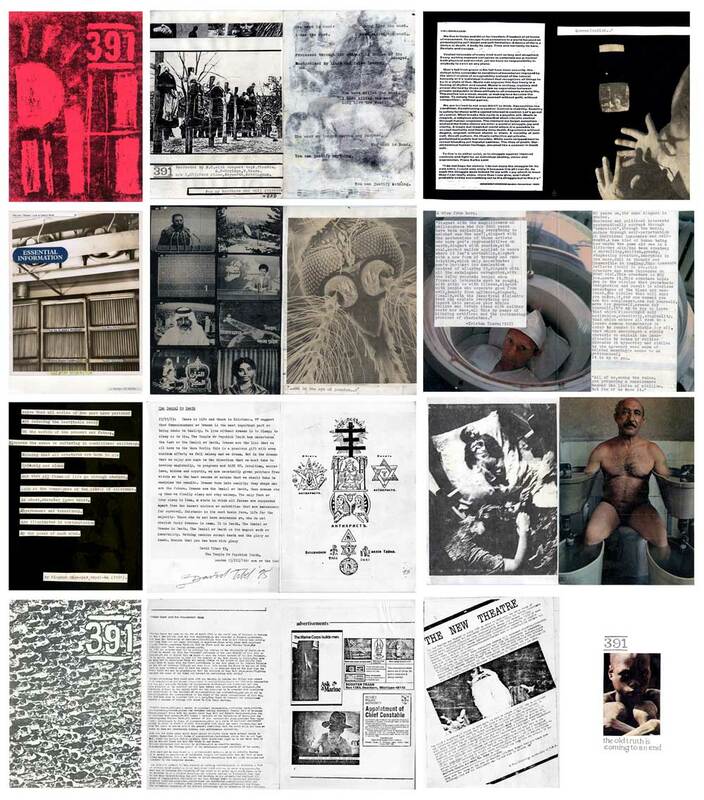 A second edition would follow in 1983, this time with invited contributions from musicians and artists I admired or felt an affinity with, David Tibet, then working with Psychic TV and subsequently as Current 93 contributed text and images, as did Fritz Catlin from 23 Skidoo. A contribution from Paul Stebbings of T.N.T Theatre Company and an essay by me on Tristan Tzara formed the bulk of the content. 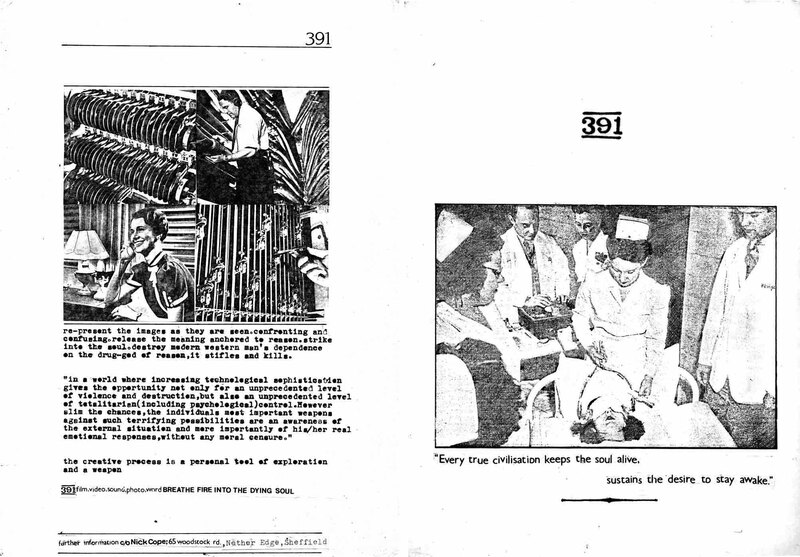 Selection of pages from the two 391 magazines. It was from this milieu that 391 would be developed from a magazine into a solo multimedia project. Just as Mark Perry’s Sniffing Glue fanzine had famously posted the image of three chords for a guitar and demanded ‘now go out and form a band’, ‘Super 8 became to film what the famous three chords of punk were to music’ (Schmitz, M.,‘The Medium was the Message’ in Berlin Super 80, booklet accompanying the DVD Berlin Super 80: Music and Film Underground West Berlin 1978-1984. 2005, Berlin: Monitorpop). Facilitating an affordable and accessible form of filmmaking on a low budget, as home video technology was beginning to impact on the amateur home moviemaking market. Super 8 became the first moving image format I could access, and over the next year or so a hybrid practice would emerge. Shooting Super 8 film, collecting old newsreels and other Super 8 footage, 35mm slides, working with audio cassette recording technologies (and video as access to the more expensive video technologies also became available); a body of material that could be used in live visual performance was coming together which would also form the basis for a planned long form video. ‘Soundtracts’ cassette cover and live performance poster (1982). Gt2 (Good Time/ 2, 1983) was my first music video work. Crude Super 8 film shot in Nottingham, Sheffield and London cut together and transferred to video by filming the projected image with a video camera, and then combined with a soundtrack produced in collaboration with Paul Watson of Nottingham based group 38th Parallel; thunderous synths and a distorted throbbing bass overlaid with my own rather nasal rendition of Dada artist and poet Tristan Tzara’s poem Good Time 2. The soundtrack would later be released on the vinyl compilation LP Born Out Of Dreams, Frux Productions, 1984. Brescia: Italy. A method of working counter to the methodology of pop promo production was deliberately fostered, whereby the soundtrack would be created after the visual. Moving to Sheffield in September 1983 and widening access to video production facilities at Psalter Lane Art College would facilitate the realization of the planned long form video project. Between autumn 1983 and spring 1984 the sixty-minute 391 video project View From Hear came together, comprising of five pieces and split into two parts; the first part consisting of two longer works – View From Hear and Gold in the Bowels, and the second part of three shorter works – Good Time/ 2, Faces of Death and Traditional Bowel Movement. View From Hear and Gold in the Bowels came together through a performative multi-projection process, whereby super 8 film and 35 mm slide projectors were lined up for projection onto a single screen and recorded using a lo-band U-matic video camera. Distribution was very much a cottage industry, with duplication facilitated by Paul Smith and Doublevision’s video tape duplication facilities in Nottingham. Filling a rucksack with copies of the video and visiting local speciality record stores in Sheffield willing to hold copies, hitch hiking to London to independent record label Rough Trade’s warehouse in King’s Cross who would take twenty copies for distribution through their own shop in Notting Hill, and national distribution via the Cartel of independent record shops. The video was also sold direct via mail order. An initial review by Dave Henderson in Sounds in July 1984 would help promote the work, followed up in the New Musical Express in April 1985 by Dessa Fox in her overview of the small number of independently released videos emerging. “… we’re on remote control search for meaning amongst the image debris of an information overdosed world. Tanks at portside, radar scanners, smoke and rubble vie with fish fingers and toothpaste ads for our fleeting attention. The pulse of the Ghost in the Machine. 391 live events continued in 1983/84, collaborating with Andrew Hulme of ambient group O Yuki Conjugate and Leeds based group Cassandra Complex. Owning their own recording equipment, Cassandra Complex put on their own gigs and events in Leeds. I was invited to participate and contribute to a number of shows, providing projected visuals for live band performances, as well as working with Andrew Hulme on pre-recorded soundtracks for immersive live projected 391 shows. Some of this material would be released on compilation audio cassettes by Cassandra Complex on their own label; and on the Leeds based Final Image label’s Beyond Entertainment audio and video compilations. Tagging their events as Complex Events, 391 would support Cassandra Complex in their second event at Le Phonographique club, an underground nightclub venue in Leeds city centre, in January 1984, having provided film projections at the first event the previous December, and headline their fourth event at Leeds’ Termite Club in March. The Phonographique venue lent itself particularly well to the 391 aim of creating immersive audiovisual environments, being a windowless underground circular venue, in which four film projectors, 35 mm slide projectors and strobe lighting were placed around the venue, surrounding the audience, with a pre-recorded soundtrack being played back through the PA system, and the author moving amongst the audience clad in black balaclava and wielding a megaphone. Other collaborations followed with Martin King in a live performance of a multi-tape loop piece Hypertension in Death City at Lanchester Polytechnic’s media arts festival in Coventry; and Crimes Against Christmas at Psalter Lane Art college, Sheffield in December 1984. 391 live performance, Le Phonographique Club, Leeds, 1984. Gallery of images from 391 magazines, flyers and posters. In-camera, fast-cut Super 8 films of contemporary life, fairground rides, industrial wastelands, off-air footage filmed from the TV screen, and film loops including footage shot of Brion Gysin’s stroboscopic flicker device, The Dream Machine. Shot whilst on display in the Butlers Wharf B2 Wapping Gallery as part of the Final Academy supplementary exhibition in October 1983, where I gave a copy of 391magazine personally to William Burroughs. Crude solo sound and music experiments with tape loops, a drum machine and a multi-track cassette recorder, available via mail order, publicized via fanzine and mail correspondence networks. ‘391 presents: An evening of music and images’ also featured music and film from local group 38th Parallel and ambient music group O Yuki Conjugate. By switching different projectors on and off at different times, a multi layered work was created, mixing live a variety of pre-planned and arranged sources of still and moving imagery, including pre-prepared film loops on some projectors. Traditional Bowel Movement also featured a production technique of shooting by means of the Umatic video camera, a Super 8 found footage film loop from an old Movietone News reel from the early 1970s featuring a clip of a young woman throwing paint over the British Prime Minister Ted Heath. The film loop was run live through two separate film projectors overlaid onto the same screen, resulting in two layers of the same image out of sync with each other repeating the moment Heath is hit by paint. Four works were created with the specific intention of constructing their soundtracks a posteriori to the visual recording and edit. The video recordings of the projected image montages were taken into Psalter Lane’s video edit suites and final versions cut together, that could then be copied off onto VHS tape. Working with Paul Watson in very much a bedroom recording studio set up; tape loops, synthesisers, bass, drum machines and percussion were built up on a simple multitrack recording facility whilst playing back the VHS tape. The copies held by Rough Trade slowly sold over the next year or so, as the author dropped by the Collier Street warehouse whenever in London to collect a steady trickle of cash for each handful of copies sold, marketed at £11.50 through Rough Trade and £10 via mail order. Its interesting to note here how Lipman refers to View From Hear as Scratch, given that it would be the follow up piece Amen: Survive the Coming Hard Times which would adhere far more to the conventions and definitions of Scratch as a video edit driven genre re-mixing and cutting off air footage. View From Hear, drew on Super 8 and 35mm slide material, more so than off air tv footage. Although this did include footage of the Falklands conflict shot on Super 8 from a TV monitor, and archival Super 8 newsreel footage worked into the projected montage mix, of original super 8 footage shot at fairgrounds, firework displays, various urban cityscapes and the Remembrance Sunday parade in Sheffield City centre in November 1983. These materials provided not only the raw material for View From Hear, but also the raw material for the live performance/expanded cinema work. Super 8 and 35mm slide projectors provided a far more accessible and affordable alternative to video projection, so the accumulation of film material for use in live performance contexts was far more versatile than off air video recordings. At the time video projectors were heavy, cumbersome, technically demanding to set up and extremely expensive to buy or hire (around £2000 to buy, and often several hundred pounds a day to hire). I collected a number of Super 8 film projectors for live work. And he actually ordered me breakfast due to the fact that I stumbled upon it for him…lol. Thanks pd! I’m curious to know more about your friends research/homework now! hope the breakfast was good!